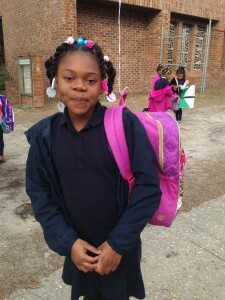 2/4/2015—Douglass Academy students are 100 days smarter. Parents gathered for a ceremony on the school’s 100th day as students in each grade level demonstrated the knowledge mastered since beginning school in August. In Kindergarten, students took the auditorium stage with books in hand. 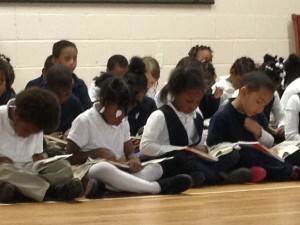 Between late August and January, the grade has learned to read. Students began with a choral reading, after which students were randomly selected for individual turns in demonstration of their focus and mastery of the content. While literacy is an ongoing struggle in traditional public schools, where only 33% of America’s fourth graders are reading proficiently, as a public charter school, Douglass Academy has the ability to choose its own curriculum and teaching method. Douglass Academy’s Reading Mastery program is delivered in small group settings with the proven Direct Instruction method. In 2009, The Roger Bacon Academy (RBA), which manages Douglass Academy, used this reading model in a partnership with UNCW and downtown Wilmington’s Hillcrest Center to remediate students who had fallen behind in public schools. The program included 17 students ages 4-8. In three months, with only nine hours of instruction, 13 of the 17 students had been brought up to or above grade level. The remaining four students had progressed an entire year ahead. It is no wonder, then, that this effective model—employed at all schools managed by RBA—has Douglass Academy’s Kindergartners reading within their first 100 days of school. Mastering this skill early provides opportunity to introduce more advanced skills sooner. Case in point: when Douglass Academy’s first graders took the stage, they diagrammed sentences down to the level of identifying prepositions and their objects. From memory, the first graders recounted a timeline of ancient history beginning with hunter gatherers prior to 3,500 BC, discussing the formation of Egyptian and Mesopotamian civilizations, and that concluded with the ascension of King Tut around 1340 BC. Second graders correctly identified continents, countries, and landmarks on a World Map in rapid succession, having just finished reciting math tables with equal fervor. With results like these from a school only 100 days in to its second year ever, Douglass Academy is looking forward to the future—and to futures. Douglass Academy’s sister schools are the top-scoring schools in their respective counties, and Douglass Academy looks forward to emulating these successes as it adds grades each year. Douglass Academy is currently accepting K-4 applications for the 2016-2017 school year in person or online at www.douglassacademy.net. For more information or to schedule a tour, please call the school office at 910.763.1976.